The glass in Renewal by Andersen® factory glazed windows (including high-performance Low-e4® glass, high-performance Low-e4® Sun glass, high-performance Low-e4® SmartSunTM glass, high-performance SmartSun glass with HeatLock® technology, patterned glass [includ- ing obscure, fern, reed and cascade designs]), FinelightTM grilles, divided light grilles and tempered versions of these glass options is warranted to be free from defects in manufacturing, materials and workmanship for twenty (20) years from the original installation date. It is also warranted not to develop, under normal conditions, any material change in appearance resulting from manufacturing defects or as a result of premature failure of the glass or organic seal for twenty (20) years from the original installation date. 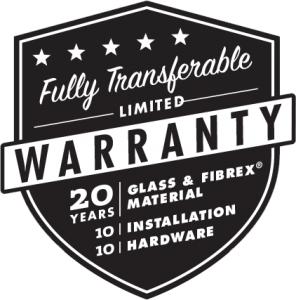 This limited warranty on glass does not apply to special order glazings, art glass, insulated art glass, impact-resistant glass or glass that is not factory installed by Renewal by Andersen. In the event a glass failure occurs as a result of a defect in manufacturing, materials or workmanship within the limited warranty period, Renewal by Andersen, at its option, will:  provide and install the appropriate replacement glass product or  provide a factory-authorized repair to the existing glass. Such replacement or repair is warranted for the remainder of the original limited warranty period. In the event a Fibrex material component fails as a result of a defect in manufacturing, materials or workmanship within the limited warranty period, Renewal by Andersen, at its option, will:  provide and install the appropriate replacement parts or  provide a factory-authorized repair to the existing product. Such replacement or repair is warranted for the remainder of the original limited warranty period. The non-glass portions of your Renewal by Andersen windows (including non-electric operators, locks, lifts, balance systems, hinges, handles, insect screens, weatherstripping, sash and frame members) are warranted to be free from defects in manufacturing, materials and workmanship for a period of ten (10) years from the original installation date. In the event a component other than glass fails as a result of a defect in manufacturing, materials or workmanship within the limited warranty period, Renewal by Andersen, at its option, will:  provide and install the appropriate replacement parts or  provide a factory-authorized repair to the existing product. Such replacement or repair is warranted for the remainder of the original limited warranty period. Installation of your Renewal by Andersen windows or other Andersen window and/or door products by an authorized Renewal by Andersen contractor is warranted for a period of two (2) years from the date of original installation. During this period, should your Renewal by Ander- sen window or door fail to perform according to our specifications due to improper original installation, we will bring the workmanship up to our professional standards, at no cost to you. THIS LIMITED WARRANTY IS IN LIEU OF ALL OTHER WARRANTIES, EXPRESS OR IMPLIED, INCLUDING, BUT NOT LIMITED TO, ANY IMPLIED WARRANTIES OF MERCHANTABILITY OR FITNESS FOR A PARTICULAR PURPOSE. ALL WARRANTIES ARE LIMITED TO THE APPLICABLE STATUTE OF LIMITATIONS, BUT IN NO CASE WILL EXTEND BEYOND THE LIMITED WARRANTY PERIODS SPECIFIED ABOVE. RENEWAL BY ANDERSEN EXCLUDES AND WILL NOT BE LIABLE FOR ANY INCIDENTAL OR CONSEQUENTIAL DAMAGES, WHETHER ARISING OUT OF CONTRACT, TORT OR OTHERWISE. THE REMEDY OF REPAIR OR REPLACEMENT OF THE ACTUAL PURCHASE PRICE OF THE PRODUCT PROVIDED BY THIS LIMITED WARRANTY IS THE EXCLUSIVE REMEDY WITH RESPECT TO ANY AND ALL LOSS OR DAMAGE. Please refer to the warranty documents provided with your purchase for complete warranty information. To obtain help under this Limited Warranty, contact our Service Line at (800) 471-8950 ext 2 – or by filling out the form below. We will contact you to learn more about the situation and arrange for appropriate action. Please complete all information on the form so we can better serve you!